Cloud platforms let anyone deploy network apps or services and make them available to the world in a few minutes. When an app becomes popular, the cloud easily scales it to handle more traffic, replacing with a few keystrokes the build-out and migration efforts that once took months. Cloud platforms represent the next step in the evolution of IT, enabling you to focus exclusively on your applications and data without worrying about underlying infrastructure. 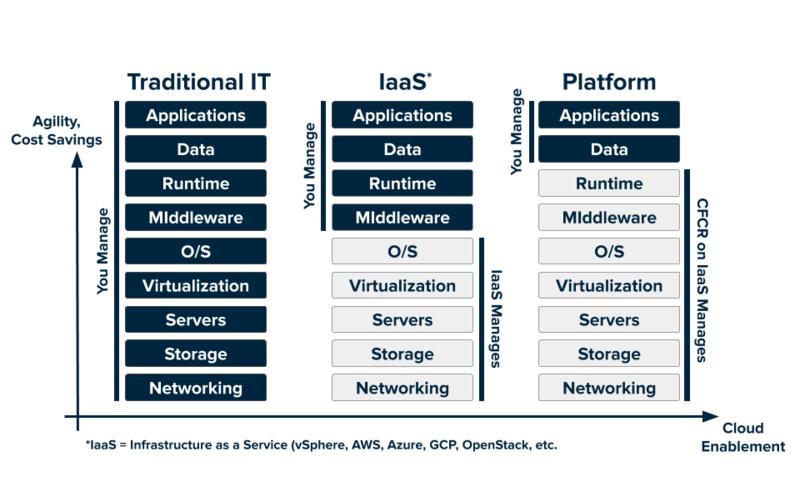 Not all cloud platforms are created equal. Some have limited language and framework support, lack key app services, or restrict deployment to a single cloud. Cloud Foundry (CF) has become the industry standard. It is an open source platform that you can deploy to run your apps on your own computing infrastructure, or deploy on an IaaS like AWS, vSphere, or OpenStack. You can also use a PaaS deployed by a commercial CF cloud provider. A broad community contributes to and supports Cloud Foundry. The platform’s openness and extensibility prevent its users from being locked into a single framework, set of app services, or cloud. Cloud Foundry is ideal for anyone interested in removing the cost and complexity of configuring infrastructure for their apps. Developers can deploy their apps to Cloud Foundry using their existing tools and with zero modification to their code. To flexibly serve and scale apps online, Cloud Foundry has subsystems that perform specialized functions. Here’s how some of these main subsystems work. BOSH creates and deploys virtual machines (VMs) on top of a physical computing infrastructure, and deploys and runs Cloud Foundry on top of this cloud. To configure the deployment, BOSH follows a manifest document. The CF Cloud Controller runs the apps and other processes on the cloud’s VMs, balancing demand and managing app lifecycles. The router routes incoming traffic from the world to the VMs that are running the apps that the traffic demands, usually working with a customer-provided load balancer. Cloud Foundry designates two types of VMs: the component VMs that constitute the platform’s infrastructure, and the host VMs that host apps for the outside world. Within CF, the Diego system distributes the hosted app load over all of the host VMs, and keeps it running and balanced through demand surges, outages, or other changes. Diego accomplishes this through an auction algorithm. To meet demand, multiple host VMs run duplicate instances of the same app. This means that apps must be portable. Cloud Foundry distributes app source code to VMs with everything the VMs need to compile and run the apps locally. This includes the OS stack that the app runs on and a buildpack containing all languages, libraries, and services that the app uses. Before sending an app to a VM, the Cloud Controller stages it for delivery by combining stack, buildpack, and source code into a droplet that the VM can unpack, compile, and run. For simple, standalone apps with no dynamic pointers, the droplet can contain a pre-compiled executable instead of source code, language, and libraries. CF manages user accounts through two User Authentication and Authorization (UAA) servers, which support access control as OAuth2 services and can store user information internally, or connect to external user stores through LDAP or SAML. One UAA server grants access to BOSH, and holds accounts for the CF operators who deploy runtimes, services, and other software onto the BOSH layer directly. The other UAA server controls access to the Cloud Controller, and determines who can tell it to do what. The Cloud Controller UAA defines different user roles, such as admin, developer, or auditor, and grants them different sets of privileges to run CF commands. The Cloud Controller UAA also scopes the roles to separate, compartmentalized Orgs and Spaces within an installation, to manage and track use. Cloud Foundry uses the git system on GitHub to version-control source code, buildpacks, documentation, and other resources. Developers on the platform also use GitHub for their own apps, custom configurations, and other resources. To store large binary files, such as droplets, CF maintains an internal or external blobstore. CF uses MySQL to store and share temporary information, such as internal component states. BOSH Director colocates a BOSH DNS server on every deployed VM. All VMs keep up-to-date DNS records for all the other VMs in the same foundation. This enables service discovery between VMs. BOSH DNS allows deployments to continue communicating with VMs even when the VMs’ IP addresses change. It also provides client-side load-balancing by randomly selecting a healthy VM when multiple VMs are available. For more information about BOSH DNS, see Native DNS Support in the BOSH documentation. As Cloud Foundry runs, its component and host VMs generate logs and metrics. Cloud Foundry apps also typically generate logs. The Loggregator system aggregates the component metrics and app logs into a structured, usable form, the Firehose. You can use all of the output of the Firehose, or direct the output to specific uses, such as monitoring system internals, triggering alerts, or analyzing user behavior, by applying nozzles. The component logs follow a different path. They stream from rsyslog agents, and the cloud operator can configure them to stream out to a syslog drain. Typical apps depend on free or metered services such as databases or third-party APIs. To incorporate these into an app, a developer writes a Service Broker, an API that publishes to the Cloud Controller the ability to list service offerings, provision the service, and enable apps to make calls out to it. Open source software provides the basis for the Pivotal Cloud Foundry platform. 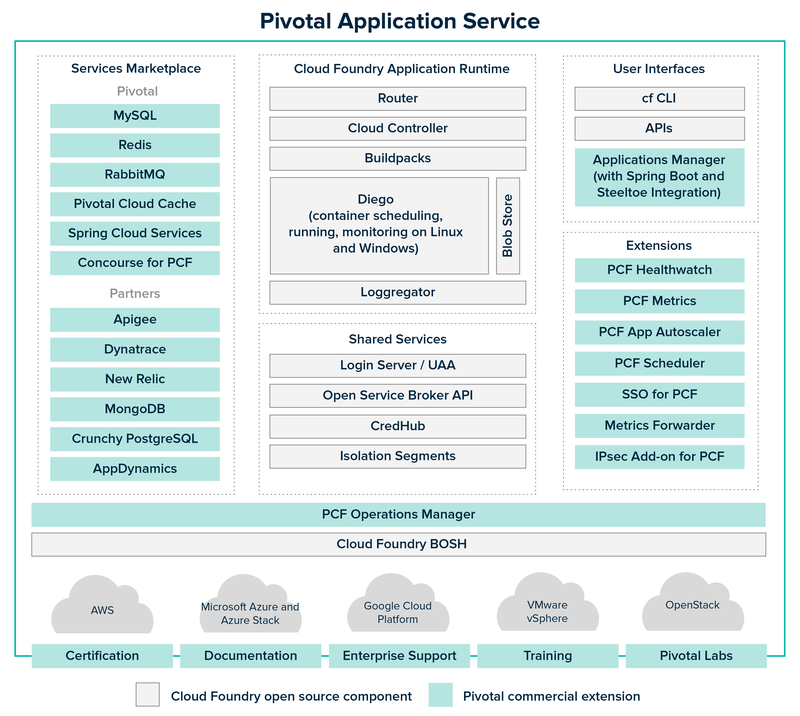 Pivotal Application Service (PAS) is the Pivotal distribution of Cloud Foundry software for hosting apps. Pivotal offers additional commercial features, enterprise services, support, documentation, certificates, and others value-adds.